Putnam County, FL– Since Monday, breaks in the case of 5 year old Haleigh Cummings, missing from her home since February 9, 2008, have caused a search team to be stationed at the St. Johns River. Sources tell blinkoncrime they are close to making an arrest in her murder. Late this afternoon sources inside the investigation have confirmed that Misty Croslin, the former step-mother and last person to see Haleigh alive, was brought back to the scene a third time. Image to the left, courtesy of scaredmonkeys.com poster grnlizard, is of Misty Croslin leaving in the white SUV. .. We have been hopeful that we could gauge her reactions from the scene, as well as the possibility she might actually tell us the truth, as we have been straight up we are not leaving without what we came for.. The recent developments are the work of a 10 month investigation by a retired FBI agent, Steve Brown, who is working for Crystal Sheffield. While many are speculating that the search teams are poised to locate the remains of little Haleigh, it is this editors opinion that they are searching for something related to what is missing from the scene, a blanket. Brown believes the presentation he gave to the Putnam County Sheriffs Office and the FDLE leaves nothing left to interpretation as to what happened in the trailor that night. “There may be other people culpable, but as to who killed Haleigh, that’s not going to be a big surprise,” Brown said. Joe Overstreet, Misty Croslin’s cousin who was in town the night Haleigh went missing, but has denied any involvement, was questioned last night at 11 PM for the third time at FBI offices in Tennesee, according to his attorney, Shawn Sirgo . Sources close to the investigation believe an arrest in this case is imminent, and that Misty Croslin is expected to testify in exchange for a reduced charge in the drug charges against her. 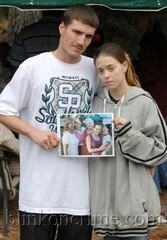 Ron Cummings and Misty Croslin have been incarcerated since January 20, 2010 on drug charges. Please check back to blinkoncrime.com for updates to this developing story. Ron Cummings, father of missing Haleigh Ann Marie Cummings, has filed for divorce from the last person to see his daughter alive, and his wife, Misty Croslin Cummings. Ron Cummings will be giving an exclusive interview this evening on the Nancy Grace Show, 8PM EST on the HLN network. This news comes on the heals of major developments in this case over the last 2 weeks. Misty Croslin’s Mother, and brother, have both been arrested on unrelated charges recently, as has Ron Cummings and his brother. Satsuma, FL– In the latest developments in the case of missing 6 year old Satsuma girl Haleigh Cummings, deputies are searching the woods and draining a pond on Stokes Landing Road. Neighbors have reported the roads to the pond have been blocked off, and the crew draining the pond have been on scene since Police dive teams were deployed to the pond Friday morning. This development comes on the heels of the arrest of Hank Croslin, Misty Cummings brother less than 24 hours earlier on an unrelated firearms charge. Hank Croslin’s wife Lindsay, his sister and Haleigh Cummings step-mother, Misty Cummings, were at Satsuma Police HQ Friday morning. There are unconfirmed rumors that Misty Cummings is in police custody. Recently, Misty Cummings sought the help of Texas Equusearch founder Tim Miller. Through the efforts of TES attorney Mark Nejame, Misty took a series of lie detector tests Miller said she failed miserably. 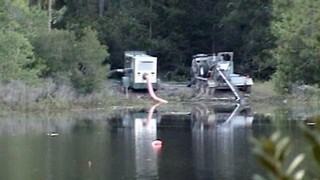 Reached for comment this morning, Mark Nejame told blinkoncrime.com the pond was in fact being drained, but had no new information. In the most bizarre video footage yet, captured by artharris.com, Teresa Neves appears to brazenly lead Cobra and his team into a backwoods area resmebling a scene out of deliverance. Ms. Neves was sobbing when she called Cobra Staubs on his cell phone from her red pickup truck and asked him to meet her at the Citgo Sation on 17. She told him she had been by herself searching out there for the past 4 hours. As they began wondering into the woods looking for clues, they abruptly lost Neves and could not locate her. Deep within the woods they had never been in, Staubs gets a call on his cell. It’s Neves. ..” Where you at.. You on the Road? You ran into a six foot Moccasin..? Who did you all up and leave us out in the woods, was this part of the plan? As Cobra and son headed towards the road, they ran into a former marine who was local. He stated that what Neves may have thought was underground prisons was his innocent hog pens. It appeared that Ms. Neves, who works as a dispatcher for the Sheriff’s Office was wearing flip flops when she met up with Cobra and would not be appropriate or footwear one would be sporting to go trouncing through the brush and soggy ground for 4 hours. Cobra thinks she set him up. For what purpose, remains to be seen. It was later discovered that the area had been searched three times previously with 168 officers, a fact that Ms. Neves would have been aware of.